Born in Western Australia, Michael grew up in Canberra, the capital city of Australia. He then went to study mechanical engineering at the University of New South Wales in the southern suburbs of Sydney. A keen racing fan he wrote a letter to race team owner Gregg Siddle looking for a part-time job in motor racing. Siddle had made his name in Europe in the late 1970s and early 1980s as manager to Nelson Piquet and Roberto Moreno. He earned his nickname "Peewee" from Piquet. After returning full-time to Australia Siddle began running racing teams in Formula Holden, the local equivalent of Formula 3000. Intrigued by the approach from a 20-year-old engineering student, Siddle tried him out and Michael was soon working for the team at weekends and studying during the week. His thesis was on data acquisition systems for racing cars. In 1993 Michael graduated and Siddle mentioned his name to Peter Collins, another Australian who was in charge of Team Lotus at the time. Michael gave up sunny Sydney and headed for windy Norfolk to join Peter Wright's technical team doing data acquisition and lap simulation work for Team Lotus. At the end of 1994 the team went out of business and so Michael found a new job at Jordan Grand Prix, doing data acquisition work with the race team. In 1996 he stayed at the team factory, establishing the research and development department, installing a seven-post rig for simulating suspension movement and designing an active differential. 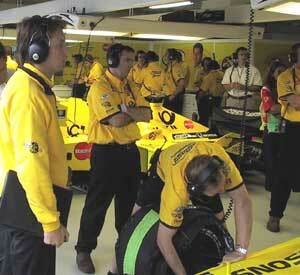 In 1998, however, he was offered the job of race engineer and began working with Ralf Schumacher. When the German departed to go to Williams Michael inherited Heinz-Harald Frentzen and in 1999 the relationship was a big success with Frentzen winning a finely-judged victory at Magny-Cours and then again at the Nurburgring. Michael remained at Jordan in 2000 before agreeing to join Williams as Senior Operations Engineer in 2001. He became technical director in May 2004 and remains in that role.